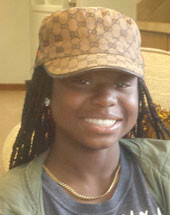 Iman is 15 years old and is outgoing. Iman wants to be a model—she likes the colors pink and purple and loves to eat chicken and watch TV. Iman lives with her older sister India. Iman is proud of her wardrobe and spends time determining what combination to wear that would best fit her mood for the day. She is knowledgeable about computers and other technology and is helpful around the house. Iman enjoys school and has additional supports to help her work to her full potential. A single or two parent family who has loads of love and can provide positive and consistent structure will benefit from opening their hearts and homes to Iman.